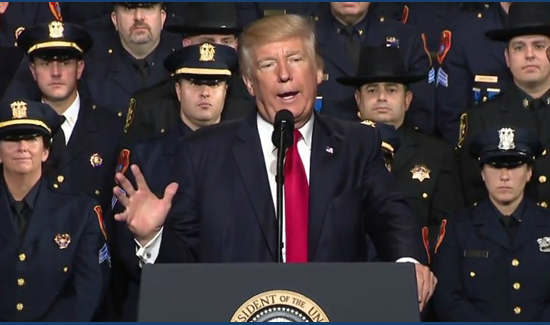 The New York Police Department released a statement on Saturday reiterating their use of force policies after President Donald Trump suggested police officers be more rough with their suspects during a Friday speech to invited law enforcement officers. “The NYPD’s training and policies relating to the use of force only allow for measures that are reasonable and necessary under any circumstances, including the arrest and transportation of prisoners,” a spokesman for NYPD said. While speaking about the administration’s efforts to take on international gangs to law enforcement officers at the Suffolk County Community College in Long Island, New York, Trump joked that officers should be rougher with suspects and suggested letting them hit their heads on police cars. “When you see these thugs being thrown into the back of a paddy wagon, you just see them thrown in, rough, and I said, ‘Please don’t be too nice,’” Trump said. His remarks elicited cheers from the audience of law enforcement, which included local lawmakers, officers from the Suffolk County Police Department, the Nassau County Police Department acting police commissioner Patrick Ryder, Suffolk County Sheriff Vincent DeMarco and deputies and jail guards from the Suffolk County Sheriff’s office, according to Newsday reporter Nicole Fuller. A NYPD spokesman told HuffPost that no one in their department attended Trump’s speech on Friday.